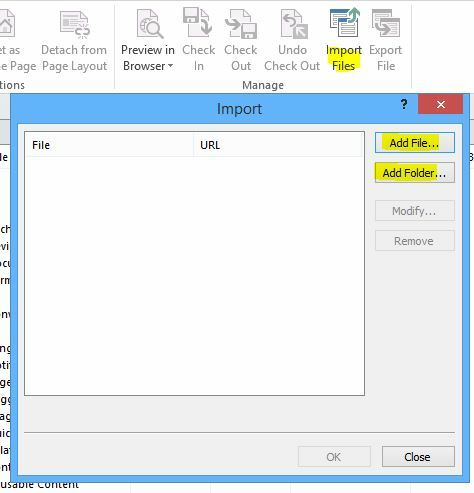 I need to upload folders and files to style library from SharePoint designer, I can't find the upload button to do that!!! There is no a frank upload button in SharePoint Designer! Using the Import files button to upload files or folder from your PC. You can also drag and drop your files and folder directly to a library in SharePoint Designer! it performs the same import functionality! Not the answer you're looking for? Browse other questions tagged 2013 sharepoint-online sharepoint-designer sharepoint-server or ask your own question.